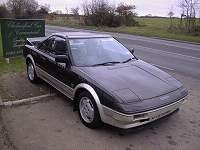 This section of my website is dedicated to the original Toyota MR2, built from 1984 to 1990. It is a truly fabulous car to drive and own, and cannot be beaten for value and thrills when the handling, performance and low purchase price are considered (anything above £1,000 will buy you one in good condition here in the UK). For those reasons it also makes a superb track day car. I will be adding some video clips from my track days very soon. Below you will find a selection of photos of the car and a set of links to pages detailing upgrades, maintenance procedures and other items of interest. MR2 Mark 1 buyer's guide - put together using information I researched, and was sent, when I was looking for an MR2. Installing a JR air filter - also applies to similar aftermarket air filters such as K&N etc. MR2 links - the MR2 section of my links page. Here are some photographs of my pride and joy. Click on them for full size versions each of approximately 75kB in size. Most of the articles above have additional photos relating to the article itself (close-ups of new components etc). Wintry MR2 More here soon!